In 2010, Broward, Miami-Dade, Monroe, and Palm Beach counties created the Southeast Florida Regional Climate Change Compact. 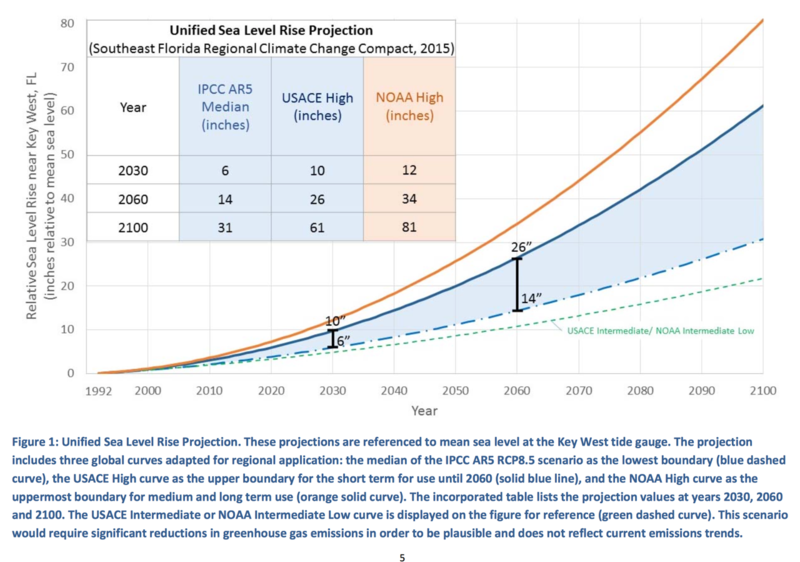 One of its goals for 2019 is to begin updating its sea-level rise projections for Southeast Florida, which were first published in 2011. The counties use them to coordinate their planning efforts. Q. When will the new sea-level rise projections be completed? A: The 2015 projections were developed by the Compact’s sea-level rise technical advisory work group, which is composed of experts within the academic community, as well as local, regional, and federal government. In 2015, this group recommended that guidance be updated every five to seven years as a result of advances in scientific knowledge via peer-reviewed literature. The compact plans to publish an update to the regional projection in 2020. Q. When will the assessment process begin and how long will it take to complete? A: The Compact has begun the initial stages of the process by preparing a survey for local users of the compact projections to better understand their needs and how well our past and current projections have been helpful. We expect significant work to be underway by summer. Q. Who will serve on the panel of experts assigned to develop the new projections? A. It will be composed of members of both the academic community and local, regional, and federal government. Q. Do you think the projections will be higher than in 2015? If so, by how much? If so, why? How does melting ice in Antarctica and Greenland make the water higher in Miami Beach, Hollywood and Delray Beach? A: Since the 2015 projections, there has been an explosion of peer-reviewed research on melting rates of polar ice sheets which have a significant influence on the “high curves” of future sea-level rise scenarios. One influential paper by DeConto and Pollard (2016) has suggested that the contributions from Antarctica can be larger than previously estimated largely as a result of the potential collapse of ice cliffs due to warming of the Southern Ocean. To incorporate this new research, the sea-level rise projections associated with the Fourth National Climate Assessment (2014) added an “extreme” scenario for global mean sea level, which corresponded to about 8 feet for the year 2100 — much higher than the compact’s 2015 high curve value of 6.6 feet for the same year. The committee will likely consider inclusion of this new research by elevating the high curve. That should influence only high-risk projects that would last more than 50 years. The committee will also evaluate recent research to determine specific implications of the potential larger contribution of ice sheets on the regional sea levels along Southeast Florida. Q. If the projections are going to be higher, what do South Florida governments and businesses have to do to prepare for the higher water? A: Analyses of tide gauge records acquired along the Atlantic coast indicate a rapid acceleration in the rate of sea-level rise since 2000. However, predicting the long-term acceleration in sea-level rise is challenging at the regional scale. For this reason, the Compact provides a range of projections for different planning and infrastructure scenarios. Local governments and businesses should continue to apply forward-thinking risk management, and consider a range of infrastructure attributes such as design life, risk of failure, and replacement costs when determining which sea-level scenario to apply to projects. “The purpose of the Compact’s convening of the sea-level rise technical advisory work group is to address how new information may or may not change our current published projections. “I do not want to speculate until they have finished their work. There are substantial existing reports and ongoing studies available that indicate a fluid situation.